On Sept. 21, 2018, the Japan Aerospace Agency (JAXA) spotted two robots landing on a C-type asteroid named Ryugu. According to JAXA’s report, they were deployed from their asteroid explorer Hayabusa2 at 9:06 p.m. PT. Sorry everyone, there is no alien invasion yet 一 just a space agency exploring the cosmos. Soon after deployment, JAXA reported that they had lost connection to their two rovers Micro/Nano Experimental Robot Vehicle (MINERVA) II1A for Asteroid-II1A and MINERVA-II1B. The team wasn’t worried because they realized the rovers were rotating on the far side of the asteroid, so connection was being cut off. On Sept. 22, after a day of silence and little sleep by the JAXA team, they received confirmation that Rover 1A and 1B had landed successfully. The confirmation came with a series of astonishing photos from the rovers after deployment and upon landing. "I cannot find words to express how happy I am…" Y.T. Currently, the rovers are hopping around the asteroid enjoying freedom after being trapped for four years traveling through the emptiness of space. It’s a shame they don’t have phones or tablets for the long trip. 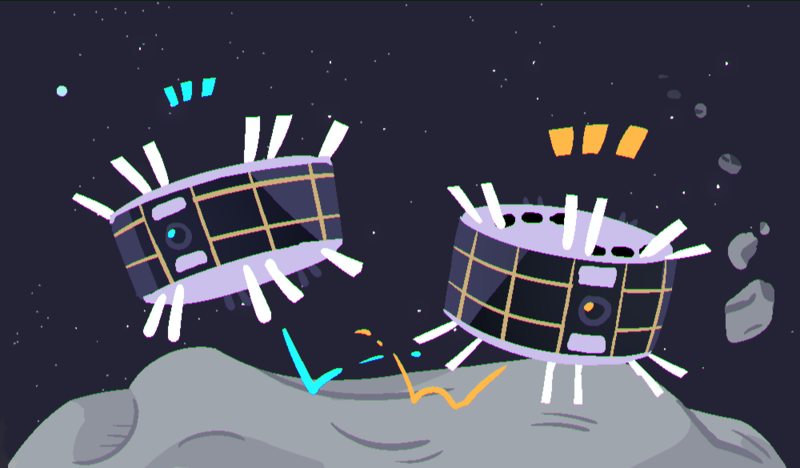 Unlike the Mars rovers (Curiosity and Opportunity), the MINERVA rovers move around like bunnies. They hop from one spot to the next. This is important because asteroids have a very weak gravitational pull, so a rover with wheels “would float upwards as soon as it started to move,” JAXA team members said. Hayabusa2 is currently 20 kilometers above looking over the rovers after dropping them off at a dangerous daycare. [MINERVA-II1] September 22 at 15:00 JST. We have confirmed Hayabusa2 has returned to the home position (altitude about 20km) as planned & the spacecraft’s condition is nominal. This completes the operation for the MINERVA-II1 separation. Thank you for your support from everyone! The main goal of the rovers, lander and Hayabusa is to find clues about the early history of the solar system and the important role these massive rocks played in shaping the Earth. Asteroids similar to Ryugu helped shape Earth in its early stages of formation. Asteroids have also beat up the Moon and left scars which will remain there for billions of years. How can an asteroid like Ryugu help us understand the origin of the solar system? Asteroids are primitive bodies meaning that they have been in our solar system since its creation and have chemically changed very little. S-type asteroids (such as Itokawa, the asteroid landed on by Hayabusa) are of stony or silicate composition and are the second most populous group. There is one more class of asteroids: M-type, which refer to its metallic composition. The future of the mission is not too far out. The next stage will be the deployment of MASCOT. It will take months before the next stage because the Sun will be blocking communication between Earth and the spacecraft. After connection is resumed, MINERVA-II2 will be deployed. The STAXA team hopes that if everything goes according to plan, they will use the collision device so that Hayasuba can collect samples which is expected to return in Dec. 2020. Hayabusa2 is the successor to Hayusaba (scientists are quite the creative specimen). Hayabusa launched in May 2003 from Uchinoura Space Center, Japan. It was a test mission to see if rovers could successfully land on an asteroid and if the new technology used was proficient. This technology included Light Detection and Ranging (LIDAR), X-Ray Fluorescence Spectrometer (XRS), sampler and reentry capsule and a mall rover MINERVA. Hayabusa landed down on the surface of S-type asteroid Itokawa on Nov. 25, 2005. This was the second time a man-made machine had landed on the surface of an asteroid, the first being the Near Earth Asteroid Rendezvous – Shoemaker (NEAR Shoemaker ) which landed on Eros, an asteroid that orbits near Earth, on Feb. 2001. In Jan. 2007, the spacecraft was finished with its mission successfully and returned to Earth in June 2010. The return was a test of the reentry capsule, which harmlessly burned before the parachute was deployed and landed on Woomera Protected Area in South Australia, the world’s largest test range. There was doubt about Hayabusa2 because in Nov. 2014, a month before its test launch, a lander called Philae failed to anchor itself to Comet 67P and bounced until it set next to a shady wall cliff. This meant that it couldn’t get any sunlight, so its scientific task was cut short. Therefore, Hayabusa2 got a few modifications, primarily to its antenna and “collision device.” The “collision device” is used to create an artificial crater that would allow the spacecraft to land safely and gather up samples. Rover 1A and 1B are not the only little fiends Hayabusa2 brought with it. Others included another rover named MINERVA-II2 and lander Mobile Asteroid Surface Spacecraft Scout (MASCOT). These rovers are expected to land on Ryugu in early 2019 and early Oct. 2018, respectively. Hayabusa2 and friends departed from Earth on H-11A rocket in Dec. 2014 from the Tanegashima Space Center on Tanegashima Island. For now we can only wait for the next stages of the mission to succeed and a safe return to Earth for the rovers and Hayabusa2. If you are curious about what Hayusaba is up to, check out Haya2Now.